Traffic counters popped up around the busy Mars Hill Road-Daniells Bridge Road intersection early last week and then disappeared nearly as quickly. Beshara said he doesn't even know who was responsible for installation of all of the counters. No permits are needed to install a traffic counter on a road in the county, Beshara said. Traffic counters typically consist of a small box—a counting devices--and one or two black cables running out from the box. 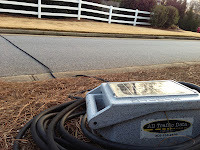 The cables register or count when a vehicle crosses the cables. Beshara said the Georgia Department of Transportation, the county and private companies put counters in transportation right-of-ways as part of traffic studies. 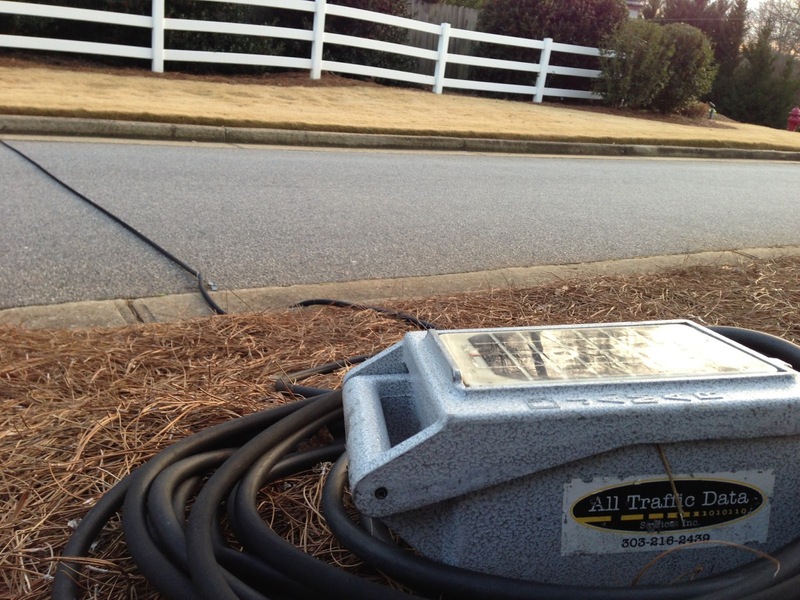 Some of the counters along the Mars Hill Road corridor were requested by GDOT, Beshara said. The county was asked to update traffic counts one more time before the design for the widening of the road is finalized, he said. The construction contract for widening of Mars Hill Road from SR 316 to Butler’s Crossing is scheduled to be awarded in September, according to Beshara. Public Works had counters on roadways some distance from the Mars Hill Road area. These were on Bishop Farms Parkway, Dials Mill Road and Meriwether Drive, Beshara said. Beshara said outside consultants are likely to be responsible for other counters in the area around Mars Hill Road. The owners of the property in the southeast corner of the Mars Hill Road intersection with Daniells Bridge Road is to submit a traffic study to the county in preparation for development of the site, he said. The owner of another property on Virgil Langford Road also is to submit a traffic study to the county, he said. “GDOT could own some of these counters,” Beshara said, but the state transportation agency usually does its counts in the summer, he added. I noticed a number of counters and asked Beshara about these before the Board of Commissioners meeting on Tuesday night. I followed up with an email message to Beshara on Wednesday, and he provided the information above via email that same day. The counters I saw were on Hog Mountain Road, Daniells Bridge Road and Natalie Drive, the entrance to Welbrook Farms subdivision, where I live. All of these were gone by Thursday evening. Beshara said the Mars Hill Road widening is on schedule. The county has closed on approximately 80 of the 129 parcels needed for the project, he said. Besharaq said he has to have closed on everything by about the middle of May in order to meet the GDOT deadline for certification of the purchases in June. The county is purchasing the right-of-ways but will be reimbursed for the cost of the purchases by GDOT. The Invasion of the Traffic Counters. They come in swarms, disappear quickly, and the road swammi has no idea. Creepy. Well, bet they say "It's busy." Closing on those last 49 parcels could be a right interesting story to tell soon.